Vladimir Putin won’t be facing off in the pope-blessed “Last Ice Hockey Game at the North Pole” until next year due to organizational snafus. A “badass lady” from India is supposedly living up to that rep by skiing from Oslo to the top of the world. 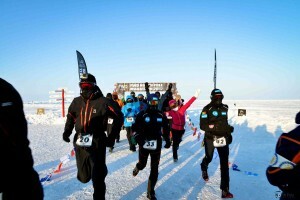 And a world-class marathoner from Hong Kong who says his competitive juices aren’t flowing for this year’s icy endurance race at the Pole also hopes to beat the 4.5-hour record time by at least an hour. Welcome to another season between 89 and 90 degrees latitude north where expedition-of-a-lifetime quests, awareness campaigns, trophy seeking, publicity stunts, outhouses from hell and lots of beer are the hallmarks of a temporary exclusive community inhabited by some of the hardiest workers and well-heeled misfits (and we don’t necessarily mean that in a bad way) on Earth. Assuming they eventually manage to make it to the starting line at the village, so to speak, which these days is just one more extreme oddity. 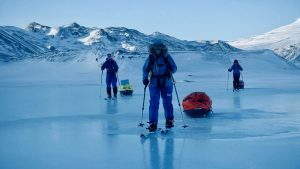 A group hoping to make a “last-degree” ski trip to the North Pole takes a training trek pulling sleds near Longyearbyen while waiting for flights to begin to the Barneo ice camp. Photo courtesy of Icetrek Expeditions. The year’s North Pole expedition season is underway in full swing this week as evidenced in Longyearbyen by lots of folks pulling training sleds in Adventdalen, piling multiple grocery carts with freeze-dried meals from huge bins set out for the next few weeks, and sitting in cafes and pubs with huge bright parkas bearing the names/sponsors of their quests. 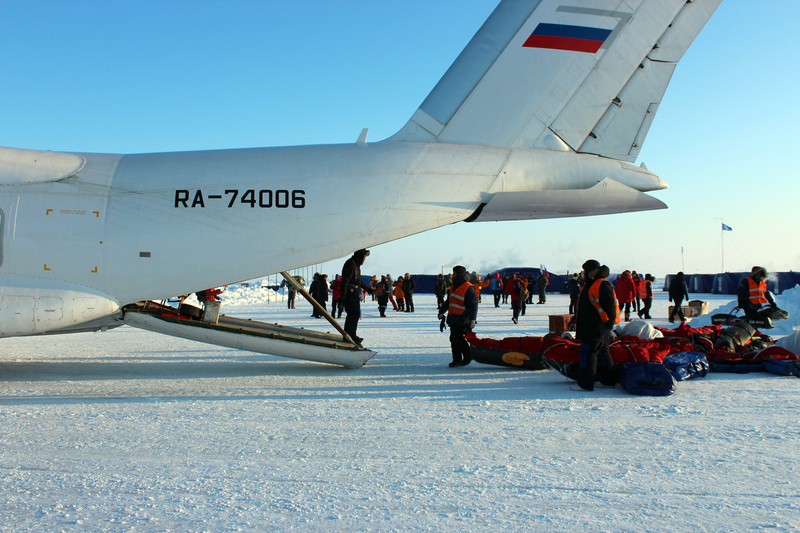 From there they’ll swarm to the cargo area at Svalbard Airport, where massive amounts of gear and emotionally-drenched passengers will be shuttled several hundred kilometers northward and back at all hours quickly subject to change. “The start of the journey to the North Pole and my eyes are fixed on beer,” wrote Richard Donovan, among the elite of the elite inhabitants as the organizer and participant in the North Pole Marathon since 2002, in a Facebook post a few days ago while wearing “crazy eyes” glasses gazing at the glass of suds dominating the picture while waiting at an airport bar for his flight to Longyearbyen. Such is levity necessary, along with lots of patience and physical endurance, for the mix of frenetic and tedious times ahead. 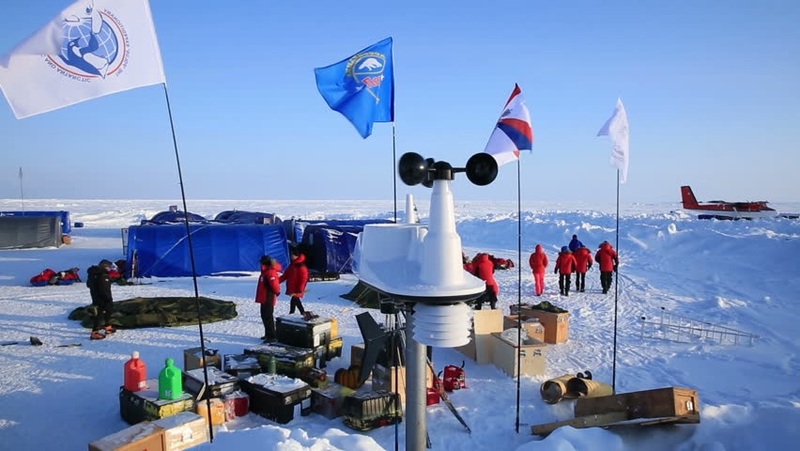 Trying to find an ice flow adequate for a support camp, including an ice runway for planes, that North Pole expeditions can start from is an increasing challenge for Barneo Ice Camp workers due to climate change. Photo courtesy of Ice Camp Barneo. The Barneo ice camp “officially” opened as scheduled on April 1, but the not-so-funny “joke” is on the first group of expeditions that already facing delays of more than a week due to problems that have become typical including building the ice runway and political upheaval – which this year includes a new twist related to the Russian/Ukrainian conflict. The first flight to the camp scheduled last Thursday now won’t depart until at least Wednesday, reminding several dozen people trying to cope with booking extra lodging in sold-out hotels and other hassles the vast sums of money they spend are no assurance of a smooth trip (or even that it will take place) since scheduling is largely at the mercy of things such as logistics and weather. “There’s a delay for all North Pole trips – not an unusual occurrence when traveling to the extreme,” the North Pole Marathon told participants in a post on the event’s Facebook page Sunday. But that trying-to-sound-upbeat message understates the snarled web of complications that are causing seasons to become more and more chaotic – and inevitably shorter to the point some never get to attempt the quest of of their dreams. As the ice camp organizers reminded everyone on Barneo’s official Facebook page after construction of the camp started in late March, it’s not like the paratroopers and other workers are lounging in the bar/mess tent that will be the communal gathering point. 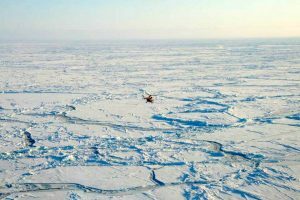 Paratroopers skydive onto an ice floe near 89 degrees latitude north to begin construction of the Barneo Ice Camp in late March. Photo courtesy of Ice Camp Barneo. 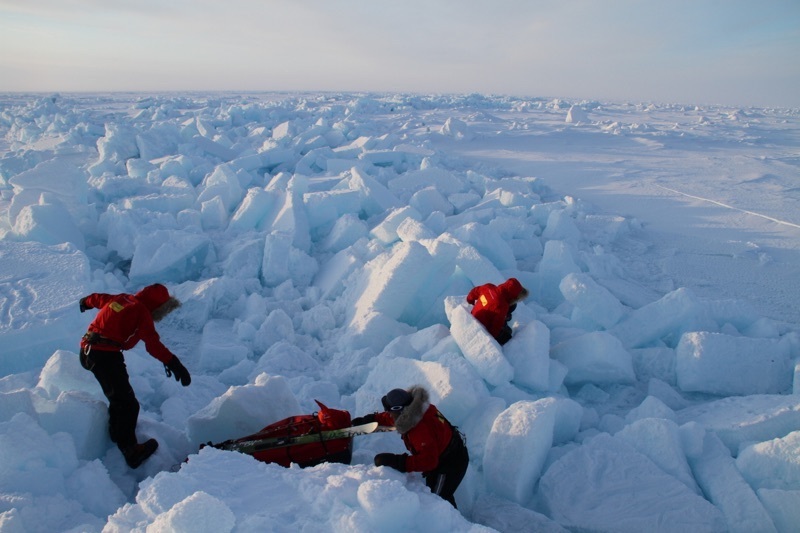 This year’s camp is initially located at N89’28, E151’41, or 59.3 kilometers from the North Pole. But those doing the most popular “last-degree” ski trip will cover considerably more distance than that during the week (give or take a few days) such expeditions typically take. “Last degree” ski trip participants face jagged ice, open cracks and numerous other complications that make the ostensibly 111-kilometer trip far longer than the crow flies. Photo by Dixie Dansercoer. Which makes the expedition being attempted by Aparna Kumar, the first female officer of Indian Police Service (IPS) and Indo-Tibetan Border Police (ITBP) to successfully conquer the South Pole, much more massively impressive – if you take media reports from her homeland at face value. There’s nothing like a hot shower (as in, literally nothing like a hot shower) at Barneo for participants of the North Pole Marathon after the race. But there are “luxuries” such as this ice bath and a community tent with lots of beer. Photo by Harry Botha. But there are ways to indulge fully in that camp experience and trip to the Pole without the subsequent week of grueling skiing. But while the alternatives may also cost a bit less, expect them to send your heart rate skyrocketing just the same. “I will not be comparing myself to other runners, but if there are other runners of the same level and the same strength, I’d like to run with them as it’s always fun to run with a companion in such a harsh environment,” he said. 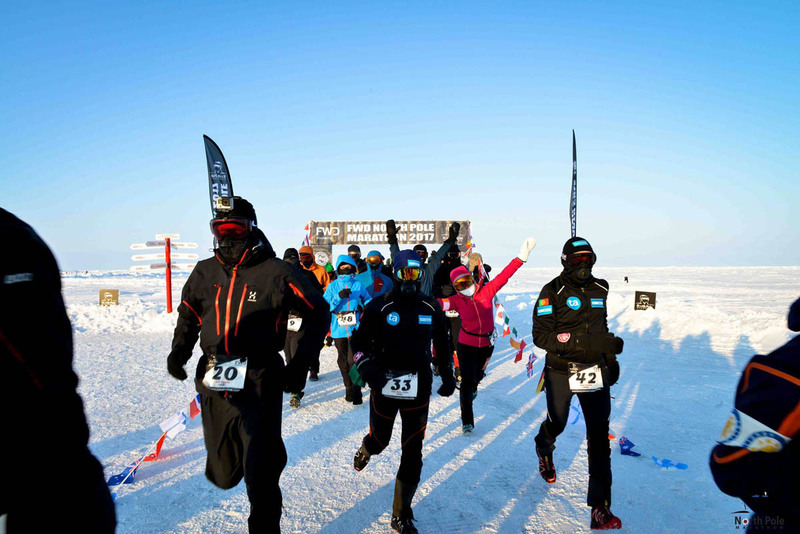 Fifty-five runners set out from the starting line of the North Pole Marathon during the 2017 season. Photo courtesy of the North Pole Marathon. 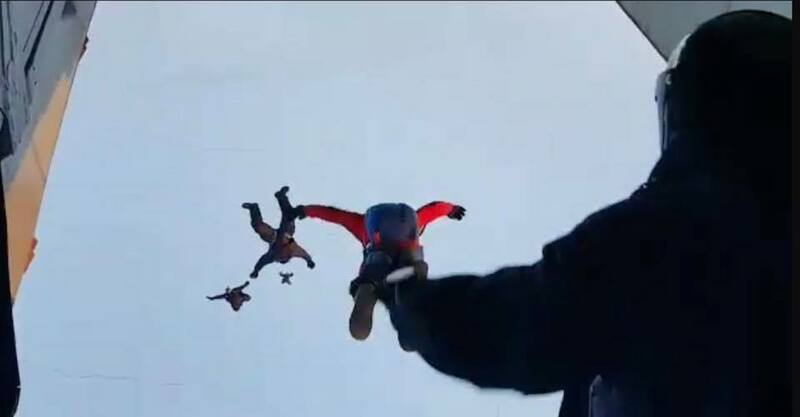 After the marathon participants are flown by helicopter to the North Pole where they participate in the traditional circular dance around the Pole while linking arms. While expeditioners may not necessarily be there yet, it’s possible some other revelers will literally drop in after jumping out of planes for solo or tandem skydives at the top of the world (cost: $37,000 solo, $77,000 tandem, $20,000 for a second jump and $40,000 for a videographer). Then they’ll return to Barneo for what is supposed to be a short layover before the flight back to Longyearbyen, during which they might or might not have the opportunity to enjoy artwork, music, and a range of companions that might include political and religious VIP visitors whose only sweat might be of the mental/emotional type. North Pole hopefuls experience the instant shock of minus 30 degrees Celsius temperatures as they step off the plane onto the ice floe at Barneo. Photo by Harry Botha. 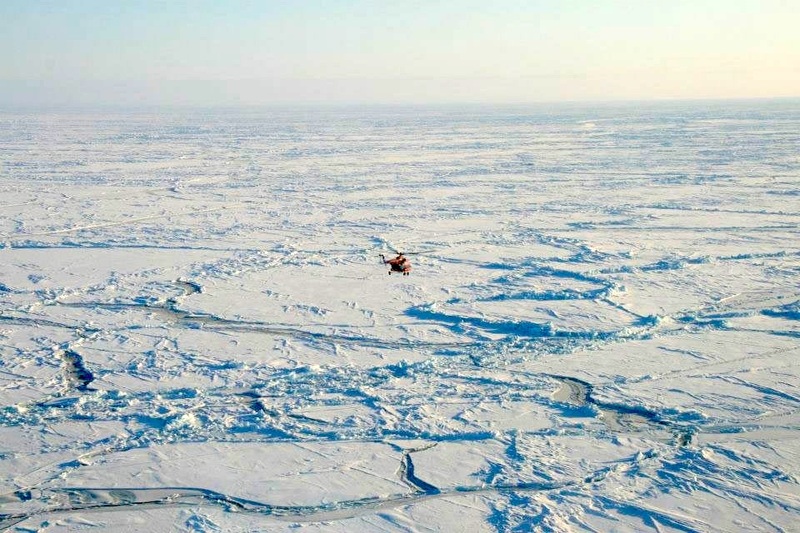 The Barneo camp was established by Russia in 2002 and seasons generally are roughly four weeks long, but worries a decade ago the vanishing Arctic sea ice might mean the permanent end of such expeditions has been greatly complicated the past several years by here-and-now organizational and political snafus. Last year’s camp was the shortest ever, officially opening nearly two weeks late on April 13 and shutting down only 12 days later. While the camp crammed everyone still in Longyearbyen into the abbreviated scheduled, numerous participants were forced to cancel their expeditions because their schedules didn’t allow for the long delay. Russia and Norway have been feuding about Barneo since 2015 when a high-ranking Russian official flaunted a ban on his entry to Norway by stopping in Svalbard on his way to the ice camp. That’s been followed by Chechen military personnel stopping at the airport, a Russian plane crash that crash landed near Barneo left abandoned to sink into the sea ice, and Norway imposing 48-hour advance notice requirements for passenger/cargo lists that defy the often impromptu adjustments necessary due to weather and ice runway conditions. Adding to the mixture this year is a dispute between Norway and the Ukraine involving the latter using its pilots and crew above 80 degrees latitude north, leaving expeditioners stranded in Longyearbyen as the two outside countries engage in a diplomatic battle for access. While interviews with random expeditioners and other North Pole hopefuls hasn’t unveiled any willing to abandon their plans yet, since most are well-advised by now to ensure great flexibility in their scheduling, one major event already is now slated for next year due to organizational problems at the lowland level. The Last Ice Hockey Game at the North Pole was originally scheduled for April 24-25 of this year, but organizers have declared it will now take place in 2020 because there was a lack of time to prepare this year.